The Maroons beat Haverford 3–0 and Wheaton 3–1 on Friday, and UW–Eau Claire 3–1 on Saturday before falling to Millikin 3–2. As their season draws to a close, the South Siders added to the momentum that’s propelled them all year. The Maroons returned home Saturday after finishing up the two-day Elmhurst Invitational, beating Haverford 3–0 and Wheaton 3–1 on Friday, and UW–Eau Claire 3–1 on Saturday before falling to Millikin 3–2. Chicago’s first match against Haverford on Friday was an impressive performance—the Maroons served 11 aces across their three sets. They racked up 38 kills, 53 digs, and six team blocks in total. Morgan Barry alone recorded seven kills and six aces. Third-year Nikki DelZenero had 32 assists and 10 digs. “I’ve had better matches during the season,” DelZenero said, “but this weekend I made a lot of adjustments and tried to better every ball for my teammates.” The first match closed with a final score of 3–0 (25–15, 25–18, 25–22). Later the same Friday, the Maroons ended a closer match with Wheaton, with a score of 3–1 (25–14, 25–21, 16–25, 25–22). As a team, Chicago compiled 50 kills, 79 digs, 8 blocks, and 49 assists. Fourth-year middle blocker Caroline Brander showcased her dominance with 13 kills and only one error on 24 attempts. For her effort, Brander was also named to the All–Tournament Team after the Invitational. 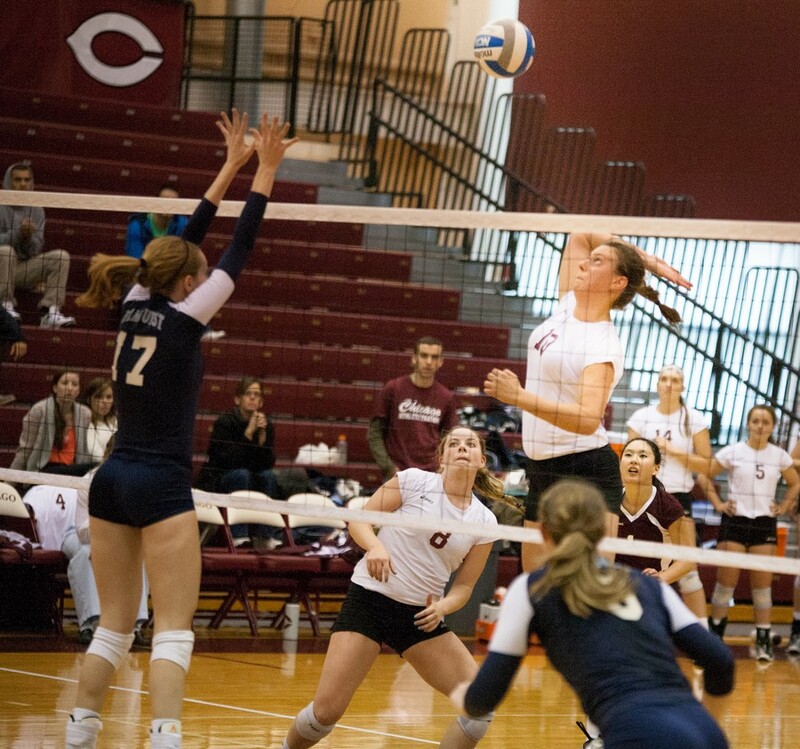 On the second day of the Invitational, the Maroons split their two matches, beating UW–Eau Claire 3–1 (25–13, 22–25, 25–19, 25–22) but dropping a 3–2 decision to Millikin (25–21, 20–25, 25–21, 16–25, 15–13). “I think that Millikin brought the tough competition against us. We were also pretty slow on making some adjustments on defense,” Walby said. After the Invitational, ninth-ranked Chicago ran its record to 23–8. But the South Siders still have room to improve—they will now begin preparation for next weekend’s Benedictine Tournament. The Benedictine Tournament marks their final slate of competition until the UAA Championship in Atlanta, Georgia.